When your kids want something to eat but they don’t want to have stop what they’re doing to eat it, a simple snack is what’s required. Something they can munch on as they play. We’ve got recipes for traditional flapjacks, savoury and sweet muffins and a good old-fashioned fruit cake that can be cut in child-hand-sized wedges. Preheat the oven to 180oC, gas mark 4. Grease a sandwich tin. When the ingredients have melted, remove from the heat and stir in the oats. Spoon the mixture into the tin and flatten. Bake for about 20-25 minutes until golden-brown. When you take it out of the oven, mark it into 8 segments. Leave it to cool in the tin. If the blueberries are frozen, allow to defrost. Preheat the oven to 200oC, gas mark 6. Prepare a 12-bun tray. If you’re using a fairy cake tin and cases, grease the tin because the mixture will bubble out over the edge. Sieve the flour and baking powder into a mixing bowl. Rub in the margarine. Add the sugar and blueberries. Beat the egg, milk and vanilla essence together and pour on top of the dry ingredients. Mix well. Spoon the mixture into the cases and bake for 20 – 25 minutes until golden and firm to touch. Cool on wire tray. Preheat the oven to 200oC, gas mark 6. Prepare a 12-bun muffin tray or fairy cake tin. If using a fairy cake tin, grease the bits of tin in between the cups to prevent the over-flowing mixture from sticking. Sieve the flour, baking powder and salt together. Melt the butter then add the milk and eggs, and beat together. Skin the tomatoes, quarter them and remove the seeds. Chop the flesh into small dice. Grate the cheese and add it, with the tomatoes, to the batter, then fold in the flour. Fill the muffin cases and bake for 20-25 minutes until golden and well-risen. Preheat the oven to 170oC, gas mark 3. Grease and line an 8” cake tin. Sieve the flour and spices together into a bowl. If you use wholemeal you will be left with bits of bran in the sieve: add it to the flour in the bowl. Rub the fat into the flour until it resembles breadcrumbs. Stir in the sugar and fruit. Beat the egg and add to the mixture with some of the milk. Mix well. It should have a dropping consistency; add more milk as necessary. Pour the mixture into the tin and level it off. Bake for about 2 hours, until firm. Remove from the tin and cool on a wire rack. 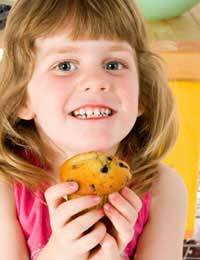 You can find more ideas to keep your kids fuelled in the 'Snacks' section of 'Kids’ Recipes'.